This was our first full year out cruising, and apparently Halcyon took a bit of a beating! Get comfy…this list is long. In San Blas, Mexico, we found some new friends and great workers to help us prettify Halcyon. Over three days, the four of us stripped/sanded/cleaned/primed/varnished the rest of the teak with Awlwood, polished all of the stainless steel and waxed the hull. It was a marathon, but Halcyon had never looked better! Our old “mattress” was pretty bagged out. So we bought new foam in Puerto Vallarta, transported it by (very small) car to Barra de Navidad, cut it using the old one as a template, and stuffed it in the cover. Voile! We lived and sailed the boat for 6 years before installing our first autopilot. I know, we’re nuts. But we finally got a tiller pilot, and modified it to work on our boat (which has a wheel, not a tiller). It can steer if we are sailing or motoring, and only uses a tiny bit of power to do it. I got a little crazy when I borrowed our friend’s sewing machine for a few weeks. I made covers for our jerry cans, propane tanks (and line and solenoid), outboard, gas tank and autopilot. I made cushions for outside. I made sides for our bimini. It was alot of sewing. The batteries we installed when we first bought Halcyon treated us well, but they were not holding a charge like they used to. So we replaced them with LTH’s (the best thing you can find in Mexico). We kept the same setup of 6 6-volts in series and then parallel. Another stanchion rebed. It seems about the time we’ve done them all, the first one starts to leak. At least we’ve got the process down now (um – but this is not it->). We bought an old used small functional watermaker from a fellow cruiser, then John rebuilt it three times. But then it worked! It is a katadyn (or Pur) 40. It only makes 1.2 gallons per hour, but it also only draws about 4 amps. So our solar panels can keep up with it. Our transmission kicked the bucket on the way into Zihuatanejo. So we found a mechanic, got parts shipped in, and had it rebuilt. In Chiapas, Mexico, we hauled out for the season and tackled ALOT of projects. Here’s the short list. We painted the topside of the hull (from waterline to deck). This project should really take up more than a single line…it took 6 weeks and every ounce of energy we could muster. And that was with help. This is a project we’d wanted to do for a long time. We started by grinding off the block at the top of the spinnaker pole track on the front of the mast, then added more track to double the length. Next we made a new block and finally mounted the spinnaker pole permanently on the mast. Valiants have undersized drains in the side decks. One leaf skillfully placed over the grate andour side decks would fill with water. Since we were repainting anyway, we took the opportunity to drill some big new holes in the side of the boat. No more puddles of water! Of course! We used ABC-4, the only red bottom paint in all of Mexico, apparently. Late in the haul out, we discovered a sizable crack on the underside of the rudder. We ground it down, filled it in with epoxy and layered it up with fiberglass. Our radar hasn’t been working up to snuff. We took it apart, cleaned it and sprayed lots of CorrosionX inside. And it helped! So yeah, it was quite a haul out. It’s truly amazing all the work you’ve done yourselves! And a whole bunch of improvements on the original – and the modified original you inherited. I wanted to fix those deck drains for 31 years. I’m sure the new engine/transmission gives you a great deal more confidence in heading out again. My sympathies on re-bedding the ports. Replacing the originals was the worst task I ever encountered since they were originally installed with 5200. We always enjoy your blog and articles and look forward to seeing you in Seattle one of these days. Fair winds. Wow, that’s a lot of work! Hard to believe you had any time for sailing with all that. 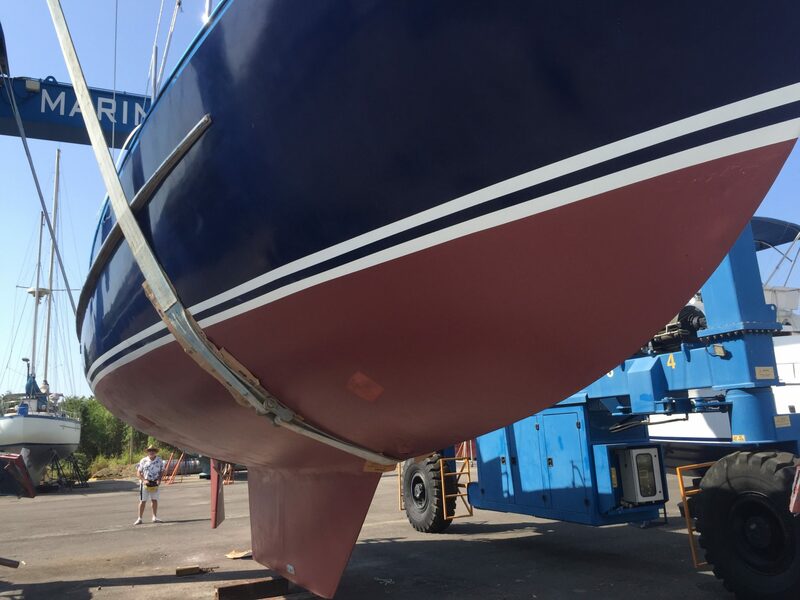 Nice choice of paint colors – you have the same blue and red as our boat now. Is it Awlgrip on the topsides? You’ve probably read the debate on bonding systems, but bonding thruhulls is the old way of doing things as far as I can tell. New theory is don’t bond because if you do then your stray current corrosion could destroy the zincs *and* thruhulls (eventually). Real fix is to get to the bottom of whether you have stray current (and maybe add a galvanic isolator).